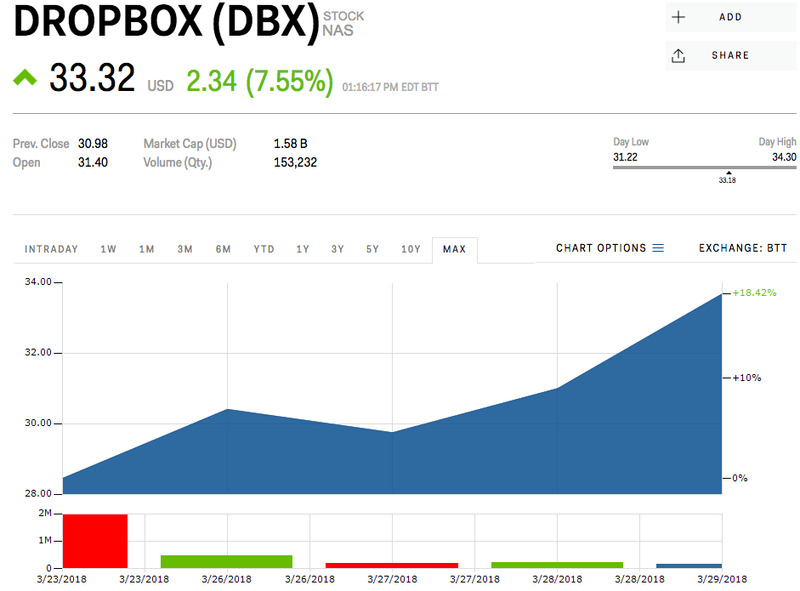 DropBox shares are soaring Thursday, up more than 7% at $US33.32 apiece. Shares debuted Friday at $US21 . Shares of Dropbox gained as much as 9% Thursday, capping off a big first week of trading for cloud-storage company. Shares hit a high of $US34.37, bringing the company’s market cap to more than $US13 billion. During last Friday’s debut, shares popped from their initial price of $US21 to as high as $US31 on the first day of trading. Shares drifted between $US28 and $US31 in the early part of this week before surging to fresh highs on Thursday. The company’s initial public offering was the latest in what looks to be a hot year for tech companies going public.Spotify is expected to do a direct public listing Tuesday, and Smartsheet filed for its IPO on Monday. DropBox shares are up 58.8% from Friday’s debut price of $US21.